This entry was posted on Tuesday, May 31st, 2011 at 11:06 pm and is filed under Dementia care, NHS. You can follow any responses to this entry through the RSS 2.0 feed. You can leave a response, or trackback from your own site. That sounds utterly sickening, Shirl. People just don’t make enough fuss about shockingly bad care – but even when they do they are ignored or fobbed off. Those of us with parents, relatives or friends accommodated in care homes, hospitals or other such places need to be vigilant, and to have the courage to raise and pursue issues when they arise. The government needs to commission an independent judicial enquiry into the CQC’s failure to act on the three reports of serious abuse that it received from a nurse who had observed it first hand. 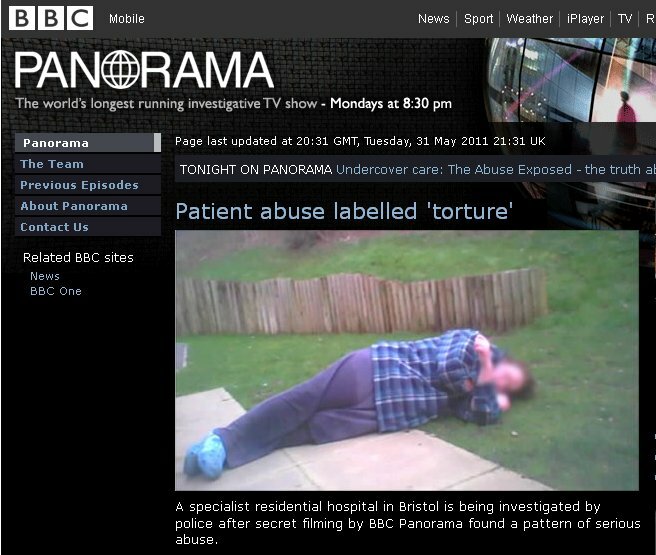 Sadly, it should not come as a surprise to any of us that this kind of abuse can and does take place. History has amply demonstrated that inadequate people will take advantage of opportunities to bully and mistreat the vulnerable. What should be treated as truly shocking, IMO, is that the government appointed regulatory body charged with the responsibility for attempting to eliminate abuse of the vulnerable within the care system has failed to act upon reports from the most reliable of sources. That needs to be dealt with as a matter of real urgency. To me it is utterly inexplicable, and an explanation must be sought. To call it a “misjudgement” is not to provide an explanation. What needs to be explained is why the CQC could ever have ‘judged’ it appropriate not to pursue the report: even once, let alone three times. Shocking. Residential care shouldn’t be a business in the traditional sense of the word. While better regulation is part of the answer, a change in attitude of the providers is also necessary. Will we see heads roll at Castlebeck? Don’t hold your breath. Yes, it truly is shocking. Funnily enough, I see the failure of the regulator as being the major problem here. The failure of Castlebeck and its staff is horrendous, but unfortunately it is to be expected in (what I would hope would be) a minority of cases. Sadly, that’s part of human nature. What is not to be expected, IMO, is that the regulator should entirely fail to act when the problem was drawn repeatedly to its attention. The regulator exists to protect us, and has no obvious motivation for failing to do so. I think we need to find out why they chose to ignore the complaints in this case. It would be a coincidence of significant proportions if the only occasion upon which they have failed to act on substantial complaints happens to be the one reported here. What about the others? I’m afraid it’s typical of the poor level of regulation and oversight that plagues this country. To not act after being contacted by a whistleblower three times is unforgiveable. Believe it or not, though these things continue, there is a long history of abuse in all forms of institutions. At one time institutions where a law unto themselves. These days people are more aware; abuse can only be hidden for so long. Yes, I am sickened by this program, unfortunately I was unable to watch it. There are too many bad memories for me. Having said that, I would encourage folks to watch it and maybe learn something from it. Hi Shirl, hope your house move goes ok. It would be great to visit for a few days. Things have been very erratic on the walking front recently. However, I am slowly easing back in to walking mode. Thursday next sees me heading for the Howgills.